November 8th is the feast day of Blessed John Duns Scotus, a Franciscan friar from Scotland noted for his theological and philosophical work in the high-middle ages (late 13th and early 14th centuries). Scotus’ work was in the generation that followed Thomas of Aquinas and Bonaventure. His work was complex and nuanced, and he is generally considered to be one of the three most important philosopher-theologians of his time. He was given the medieval accolade Doctor Subtilis (Subtle Doctor) for his penetrating and subtle manner of thought. the idea of haecceity (or “thisness”), the property supposed to be in each individual thing that makes it an individual. Both of these concepts are believed to have arisen out of, in part, the influences and vision of St. Francis of Assisi. For Scotus, univocity of being is that which binds us most deeply in the divine life and allows us to see God in all things. It is at the core of human dignity, yet it is haecceity (thisness) which distinguishes each life and makes it uniquely loved by God. In other words, God loves all of humanity, but God specifically loves the single person in a unique way. Theology. Interestingly, it is his theological insights that are most profound and for which he is little known, even if those insights have far reaching implications. Perhaps one of the most well known of his theological works was a complex argument for the existence of God. Many of his contemporaries were unable to follow his reasoning. Remember, he wasn’t called the Doctor Subtillis (Subtle Doctor) for no reason. Dunce. The later followers of Scotus, Scotists, were noted for their argumentation that was so subtle it carried little power to convince. These followers were called Duns or Dunsmen. When, in the 16th century, the Scotists obstinately opposed “new learning,” that is, they challenged the basis and validity of the translation of the King James Bible, the term duns or dunce became, in the mouths of the Protestants, a term of abuse, a synonym for one incapable of scholarship. Clearly the word “dunce” carries into modern English use. Fortunately, the connection to Blessed John Duns Scotus has been lost – at least until now. Immaculate Conception. Perhaps the most influential point of John Duns Scotus’ theology was his defense of the Immaculate Conception of Mary. At the time, there was a great deal of argument about the subject. The general opinion was that it was appropriately deferential to the Mother of God, but it could not be seen how to resolve the problem that only with Christ’s death would the stain of original sin be removed. While the Church had celebrated the feast as early as the 5th century, the idea met opposition on the part of medieval philosophers and theologians, notably including Saints Bernard of Clairvaux, Albertus Magnus, and Thomas Aquinas. St. Thomas Aquinas opposed the idea of the Immaculate Conception, on the ground that unless the Blessed Virgin had at one time or other been one of the sinful, she could not justly be said to have been redeemed by Christ. John Duns Scotus proposed a solution to the theological problem of reconciling the doctrine with that of universal redemption in Christ, when he argued that Mary’s immaculate conception did not remove her from redemption by Christ; rather it was the result of a more perfect redemption granted her because of her special role in salvation history. At the end Scotus cites Anselm of Canterbury’s principle, “potuit, decuit, ergo fecit” (God could do it, it was appropriate, therefore he did it). Christ the King. Another of Scotus’ positions also gained official approval of the Roman Catholic Church. His doctrine on the universal primacy of Christ became the underlying rationale for the feast of Christ the King instituted in 1925. But Scotus’ doctrine on the universal primacy of Christ also became the basis on reconsidering the reason for the Incarnation. What Scotus saw in these verses was that apart from humanity’s sin and sinfulness, the very intention of creation itself was what determined the presence of Jesus among us. The medieval axiom was that what was first in action was first in intention. Since creation preceded sin, the intention of the Incarnation was to be found in God’s creating the world. In short, while affirming that Christ died for our sins and without His atonement humanity’s salvation would not be possible, Scotus held the subtle position that dying for our sins was more of a “what” than a “why.” A simple explanation would be the answer to this question: “If Adam and Eve had not sinned, would there have been an Incarnation?” Scotus’ answer is “yes,” Jesus would have come anyway – such is the nature of God’s love and the primacy of Christ. That is the short answer. As you might expect the long answer is a bit subtle. 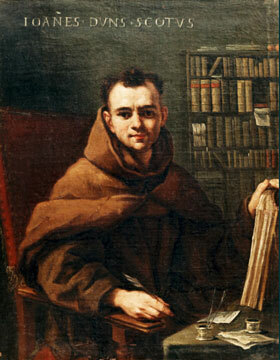 This entry was posted in Catholic, Franciscan and tagged Dun Scotus, franciscan, John Duns Scotus, Scotus by Friar Musings. Bookmark the permalink. Adam, Eve, Sin I think they are all God’s plan to bring Jesus to life. It’s not a matter of “If”, it’s “when”.